Recently I was prompted to try taking photos of the TV which currently serves as a monitor for my XT, because reasons (which may be made clearer in the future if I'm not lazy and/or distracted by other things). After much trial and error, I think my current results provide an accurate representation of what's actually visible on the screen. Video source: an IBM Color/Graphics Adapter (late-type composite output stage, AKA 'new-style') sending 60p NTSC video over the RCA jack. TV set: A 14" CRT Brother model (BR7414H) made in China, 1998. Camera: Canon EOS 700D (aka "Rebel T5i"), with a Canon EF-S 18-135mm zoom lens. TV photo: the 16 artifact colors that a new-style CGA generates in mode 6 w/foreground 15. Slightly turned down the TV's 'colour' setting here, due to new-style CGA's raging saturation. 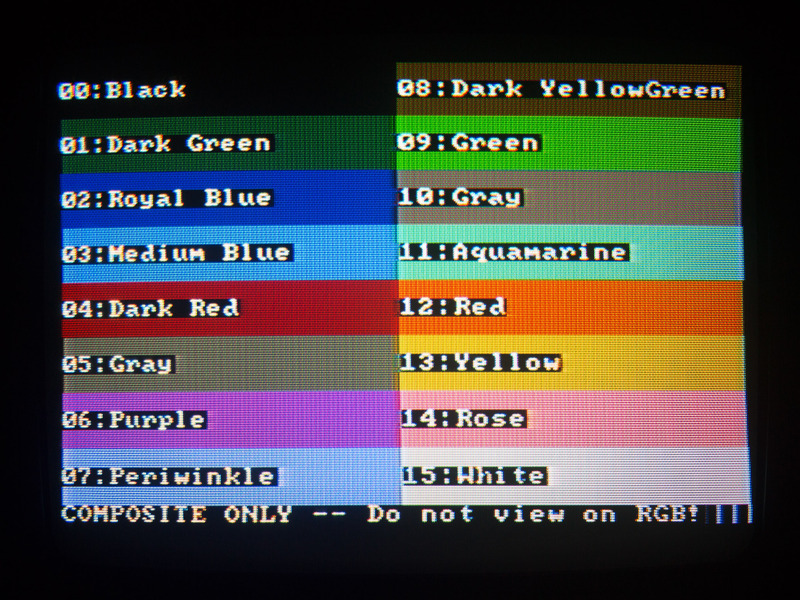 TV photo: the 16 direct colors that a new-style CGA generates in 40-column text mode. Yes, 'brown' is always dark yellow over composite. If you only care about the actual screen content, get rid of any ambient light. You don't want white balance mismatches between your room lighting and the TV, and you certainly don't want reflections off the glass face. Any photon that isn't coming directly from the TV is TEH ENEMY, so keep 'em out. Also, use a tripod, yes? Obviously this changes from set to set, so use your judgment and experiment. Just don't do silly things like over-brightening the blacks, etc. You want to represent what you see on the screen during normal viewing. This would be good to keep in mind: camera settings probably give you some leeway to experiment with brightness; but with contrast and saturation you have to be a bit more careful. You might even want to decrease the saturation a bit from what looks subjectively "right" at first glance, because the clipping of colors due to oversaturation can skew the apparent color space in annoying ways. When you're shooting a still image (as I was doing here) there's no need to match the TV's refresh rate, which is ~59.93Hz in my case. In fact 1/60 gave me terrible interference patterns (moiré), and while I have a hunch why that happens, that doesn't really matter. 1/20 worked well enough in my case. Can be a bit tricky; you don't have to know the ¡SCIENCE! in intimate detail, just understand the focal length and the interplay between this and shutter speed/ISO. In combination with the other values listed, F = 4.0 turned out to be optimal for me. Generally you don't want to set this very high because it can introduce noise, even though the face of a CRT TV is full of fine detail in much greater amplitude (scanlines, phosphor dots/strips) so you're unlikely to notice any of that. I settled for 200. In theory 6500K is the standard white point for TV, and decent/newer sets can be adjusted to this (it'd even be somewhat accurate). In practice, older CRT TV color temperatures are all over the place: it was found that an electric blue tint had more of a sensory impact on consumers, so manufacturers used to race each other to the higher end of the scale (not unlike the music industry's Loudness War). So again, it's up to experimentation. My TV appeared too blueish even with the camera's highest WB preset of 7000K, and I had to manually add a white balance shift factor of A4 (towards amber/away from blue) + G3 (towards green/away from magenta). Adobe Camera Raw interprets this as a WB of 8200K with a tint value of -8; not sure how correct those values are, but the result looks correct indeed. The exact workings of these parameters are probably particular to Canon EOS cameras, but of course the idea is to avoid artificial 'enhancements' as much as possible. In my camera Contrast runs from -4 to 4, and only the very lowest setting gives me faithful reproduction: any higher than -4, and the CGA's dark grey gets even darker than it is on the TV screen, eventually clipping into black. I suspect (but don't know) that -4 is the 'neutral' setting, and anything higher artificially adds contrast. Artificial sharpening is bad in general, and on a nice focused picture of a CRT screen with all those tiny details, you want it like you want a flesh eating disease. The "Standard" setting in this camera has Sharpness on 3 (it goes from 0 to 7); for best results I take it down to 2. 0 looks a little softer than it should be; I suppose it might depend on the camera's anti-alias filter and other things, but there you go. Unless your CRT is of the flat-screen variety, it's a bad idea to just shove the camera lens right in its face and shoot away. Up close, the convex surface introduces a very exaggerated barrel distortion to your picture (I made that mistake in a previous post). Just position the camera about 1m away and zoom in with the lens. You shouldn't auto-focus either, because such mechanisms are going to have a terrible time 'locking' onto the confusingly-detailed picture on the TV screen. A simple but effective way to get good manual focus: on a digital LCD viewfinder, an optimally-zoomed image of a CRT TV will show prominent moiré patterns, but this only affects the image on the viewfinder itself. Find the two points of the focus ring where these patterns completely disappear from the viewfinder. At the mid-point between them, the interference will be at its worst: that's actually your optimal focus, because this means you're sampling the most high-frequency detail (therefore, the sharpest image). ¡SCIENCE! to the rescue again! When saving the image, include the ICC color profile just in case, so any viewer will be told up front about our nice and standard sRGB color space. This proved trickier than anticipated. Again, those tiny little dots of phosphor light create a lot of high-frequency image data; when downscaled by an appreciable factor (e.g. for thumbnails) the frequency is increased, shoots past the Nyquist limit and you're back in moiré city. Before you resize then, you want to remove detail with too high a frequency - in other words, apply a low-pass filter: Gaussian blur is just that. How much of it you apply (radius) is up to the image and the scale factor: find the amount that acceptably reduces interference patterns and don't go any higher than that. But it's still not that simple. Photoshop (CS6, at least) doesn't do resizing and blurring in a gamma-aware manner: it simply blends color values linearly and calls it a day. This will considerably darken your image and shift your hues, and you don't want that. Fortunately, it seems that working in 32 bits/channel mode eliminates this problem, or at least mitigates it well enough that you can't tell it's there. So, first convert the image to 32 bits/channel, apply the blur, then convert back to 8 bits/channel (use "Exposure and Gamma" as the method). Then resize - the "Bicubic (best for smooth gradient)" filter looks nice enough for my purposes. Resizing. The rightmost image is optimal: moiré is minimized and tone/brightness is preserved. One issue that still affects the final photos is non-uniform brightness - the image is darker towards the edges of the screen than near the center. But I guess that's a side-effect of the convex face, so I shouldn't correct for it really... even if it was easy (it's not). That's it then... any comments, ideas, and/or tips for further improvements are both welcome and appreciated. Looking good! This is actually pretty similar to my setup. I'll have to look into the moiré patterns at 1/60 and see if I can figure out what's going on there. Do you have a remote shutter cable? (They're really cheap). I'm thinking of trying to wire mine to my XT in such a way that I can synchronize the shutter with the CGA card's vsync signals and get a perfect single-CRT-frame photo every time even for moving images. Another issue I forgot to mention is the slight mismatch between the shutter speed and the CGA vsync, which isn't exactly 60Hz after all. With my settings that gives you a slightly darkened band, as you can see in the second photo just above the "calibrate monitor" text. Snapping consecutive photos you can see it slowly crawling up the screen and eventually disappearing before it crops back up at the bottom (which is why the first photo doesn't have it). But having to time for that is sort of annoying; and I expect it to look far more pronounced at 1/60. I think most DSLRs have a "shutter open while button pressed" mode. Combined with the remote shutter cable connected to the XT (and possibly also a timer interrupt) that would solve the "dark band" problem once and for all - just arrange things so that the shutter opens on one vsync and closes on the next one (or N vsyncs later if you want a longer exposure). If taking a picture of a still image, you probably want more than a single frame's exposure to lessen noise. IMO, there's no need to jump through hoops: Just set ISO as low as your camera goes, set your aperture to an appropriate value such that both the front and curved corners of the CRT are both in focus (use a depth-of-field calculator if unsure), and then adjust shutter speed such that the image isn't blown out. You'll likely land somewhere on or under 1/30, and that will eliminate any dark band. 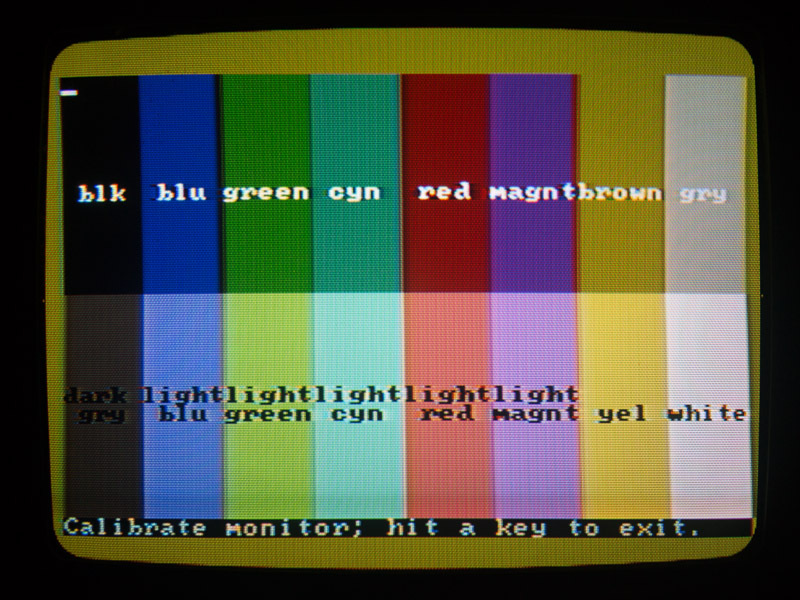 If shooting VIDEO of moving CRT images, however, then you MUST fix shutter speed to the refresh rate of the monitor. Too slow and you'll get blur in areas of motion, too fast and you'll get dark bands. This holds true even if your video capture rate isn't the same as the CRT refresh rate, since the frame that gets recorded is what makes it past the shutter. In other words, shooting 24p with a digital camera does not limit you to a 1/24 shutter speed. Neat ideas! I'll definitely look into getting a remote shutter cable; even if I can't wire it up to sync with the CGA refresh, it'd at least alleviate the need for physical pressure while snapping the picture (this camera's shutter button requires quite a bit of force, which can and does screw with stability - even with the tripod). I suppose the "shutter open while button pressed" mode is what Canon calls "bulb exposure". My camera has this, but no custom fractional speeds. Wonder why the latter would be a high-end feature when the former is common. Nice CRT! I was looking for a old game by infogrames “Armorik the Viking” and found your page, would you consider selling it? I know it’s just a clone of the famous ghosts and goblins but I have very good memories of that game, If so feel free to let me know at [SANITIZED]. Keep up the good work.